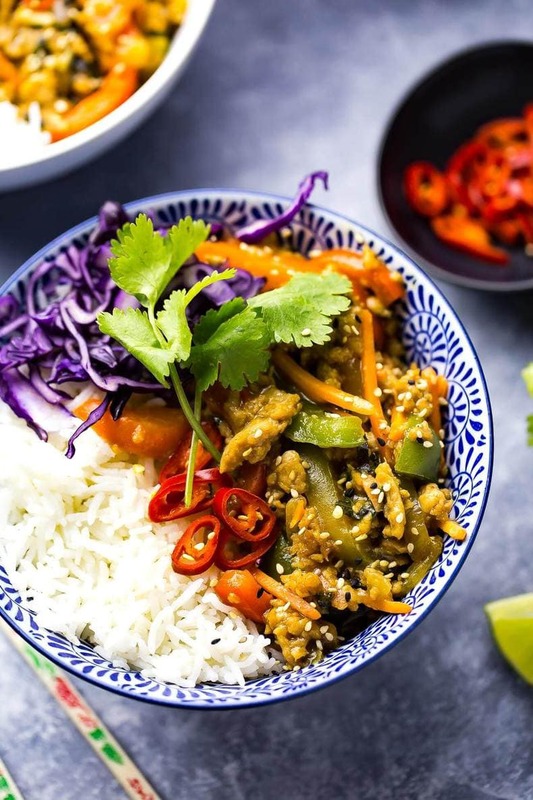 These Thai Basil Chicken Bowls with Coconut Rice, bell peppers, carrots and red cabbage are the most delicious stir fry bowls and are ready in just 20 minutes. They also make great leftovers! Say hello to more 20-minute dinners from yours truly. Everytime I make a super quick recipe like this I always ask myself why I don't post more of these kinds of recipes to the blog. I mean, it's not hard to sell you on something that allows me very little clean up and a short time actually cooking in the kitchen. As a full-time food blogger quick stir fries make my workday much more efficient.?? 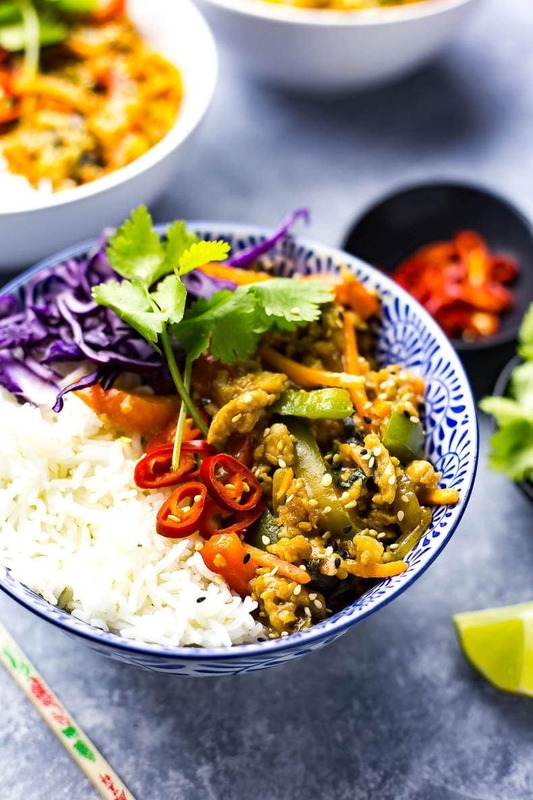 Efficiency aside, these Thai Basil Chicken Bowls are served alongside the most fragrant, mouth-watering Coconut Rice and are filled with a ton of veggies. It's the kind of meal you put together after a long day with veggies from the fridge that are about to go bad, or it's the kind of dinner that comes together with just enough time to run out the door and get into other activities in the evening. Honestly, when people tell me they don't have time to cook I think it's a little ridiculous. I know grocery shopping is time consuming and takes some planning and looking ahead at the work week. I know it's not always so easy, especially if you are cooking for a bunch of people. 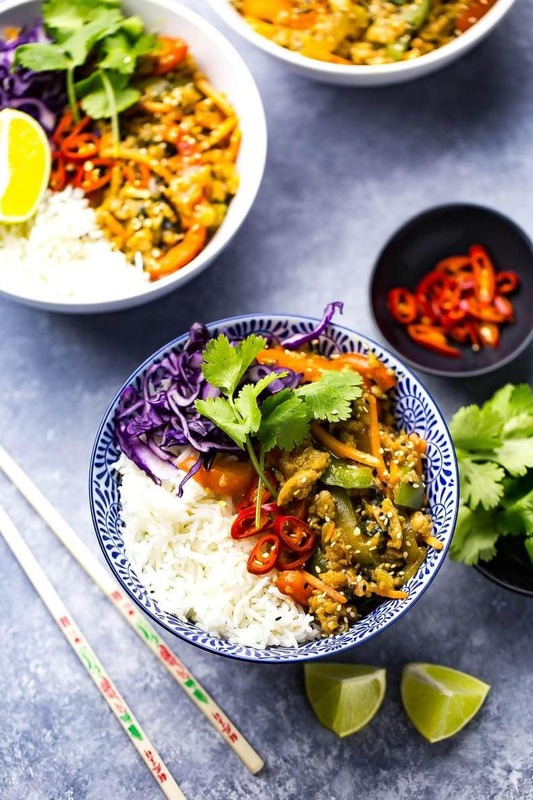 But quick meals like these Thai Basil Chicken Bowls are filling, healthy and tasty and will totally save you on busy days where you have a billion other things to do, mostly because they come together in under half an hour. Soccer practice? Night class? Worked until 8 at night? Just a few ingredients, a rice cooker and a big frying pan full of chicken and veg with a simple soy-fish sauce mixture, and you've got a PILE of food. Enough even to maybe give you three lunches to take to work if you're just cooking for yourself. What I try and do at the beginning of each work week now is think about what I can make that will give me leftovers for lunch. 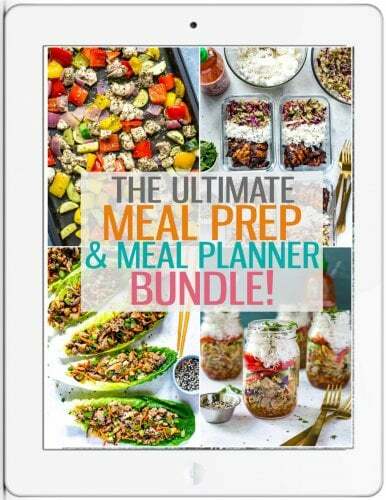 That is seriously the best way to save time and eat so many delicious things during the week. Will things reheat well? Will the portion size be big enough to take to work the next day? 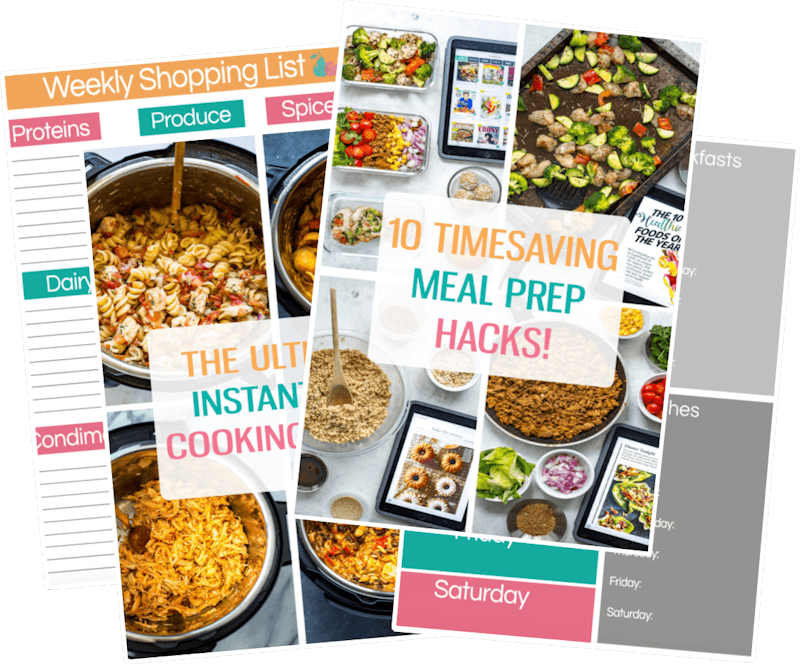 You can save SO much money just by planning to batch cook a bunch of meals, and batch cooking doesn't have to mean three hours spent in the kitchen meal prepping every Sunday. 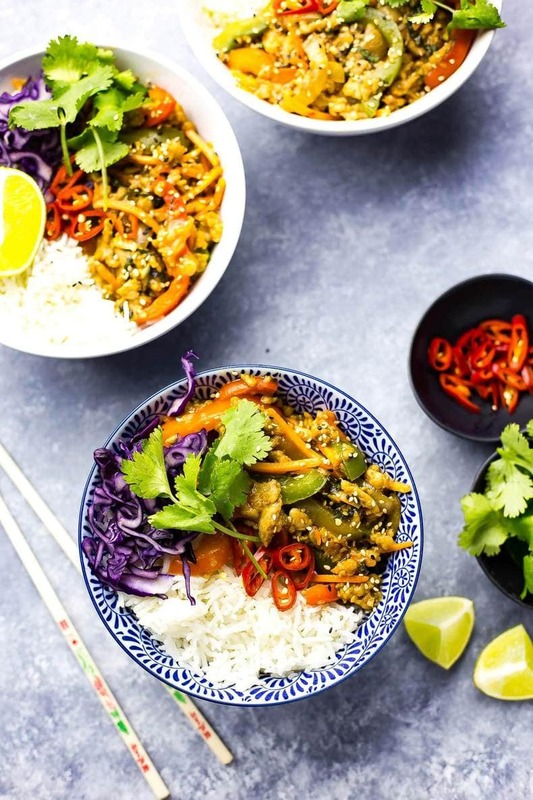 It can simply mean making a big batch of food, like these Thai Basil Chicken Bowls with Coconut Rice, and serving them other nights or for lunch throughout the week after you've enjoyed them for dinner. I swear, I survive only because I cook this way. I have many friends that are busy during the work week every evening, whether it's socializing, volunteering or being part of some sort of sports league. Nowadays it's much easier because I set my own work schedule and prefer to work more traditional hours, typically from 8:30am to about 6:30 or 7 at night. This means that I have more free time during the evenings, but I usually head to the gym after work for about an hour and a half so that basically leaves me to make dinner at 8:30 or 9pm, which is insane, I know. 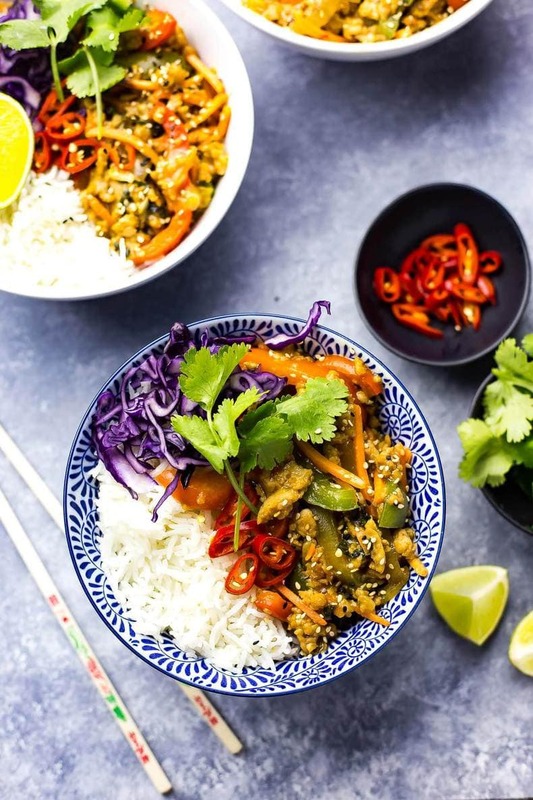 So anytime I can make a quick meal like these Thai Basil Chicken Bowls I'm all for it. 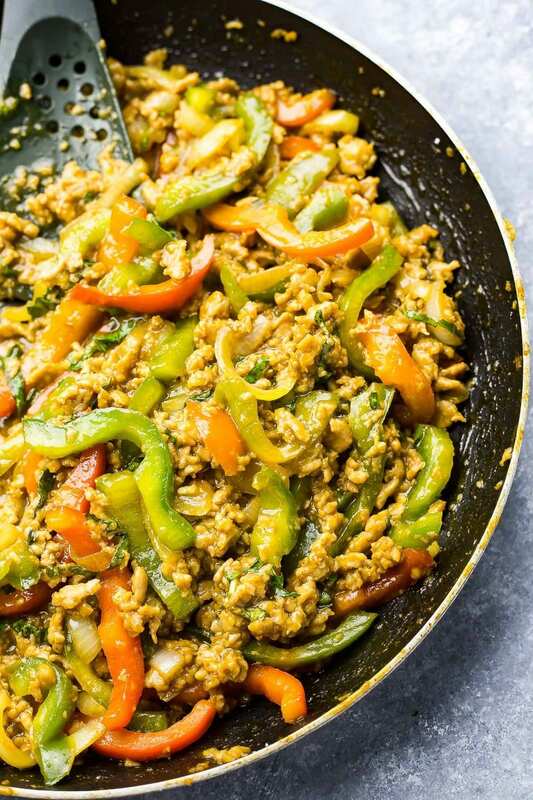 Will you be whipping up some of these Thai Basil Chicken Bowls with Coconut Rice? What is your weeknight evening schedule like? Please tell me I'm not the only one who likes to eat super late at night. I mean, they eat late with a bottle of wine every night in Europe so maybe they are on to something over there? Anyways, you know the deal. If you try any of my recipes be sure to let me know on Instagram, Twitter, Facebook or in the comments – I’d love to see what you create!? 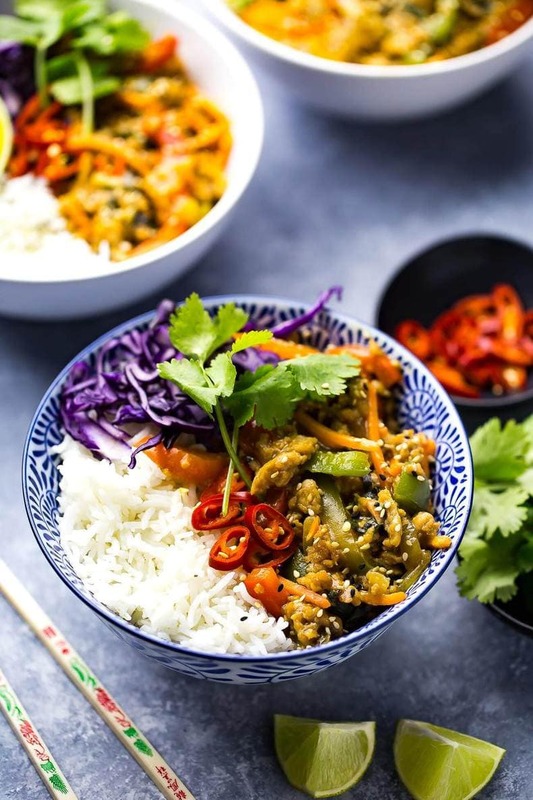 These Thai Basil Chicken Bowls with Coconut Rice, bell peppers, carrots & red cabbage are the most delicious stir fry bowls & are ready in just 20 minutes! Cook rice according to package directions, subbing in half of the water for the coconut milk (this is more easily done in a rice cooker but can be done on the stovetop). Mix together corn starch, soy sauce, fish sauce and honey in a small bowl. Set aside. Heat olive oil over med-high heat in a large frying pan. Add chicken and 2 tbsp of sauce, breaking up with a spoon and cooking for 3-4 min. Add garlic, onions and peppers, sauteeing for another 3-4 min until veggies soften. Add stir fry sauce, carrots and cabbage, sauteeing for another 2-3min. Stir in basil and remove from heat. Serve in bowls along with coconut rice, garnishing with chilies, sesame seeds and cilantro. This looks delicious! Loving the colours! Oh my goodness, made this for lunches this week and it is SOOOOO good.